It is made thin - only 8mm in thickness, and manual hand-winding is required. Sea-Gull ST17 automatic movement is modified to be hand-winding after its self-winding rotor has been removed. Sapphire front crystal, solid stainless steel case back. 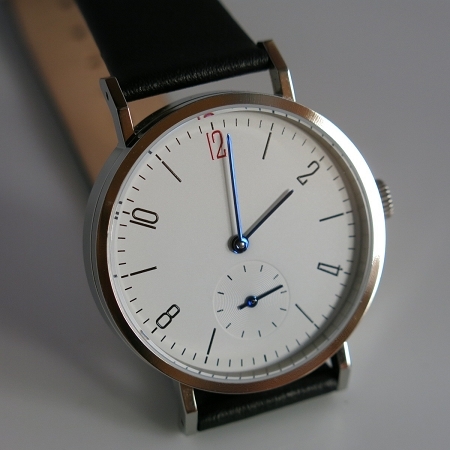 Clean and simple, this miniature Bauhaus style watch (diameter 35mm) is designed to cater for demand by small men and ladies. Genuine leather strap comes in either black or brown. Please leave message on preference, otherwise color will be chosen at random. Thank you for looking at this product.